Santa and his donkey,accompanying by two squirrels an a Robin are together heading to the town on Christmas Eve. 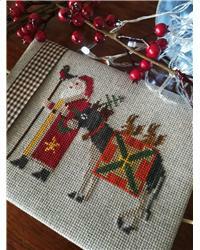 Santa's Trilogy II is the second pattern of Trilogy series. It's designed and stitched by Nurdan Kanber. Stitched on 20 count Zweigard Aida.